The SIPS project will design and evaluate interactions on spherical displays in public spaces. It’s an exciting time for public and performative interaction at Glasgow University. My first EPSRC grant has been funded, the announcement is available now on the EPSRC website. So watch this space, this grant begins August 1st! 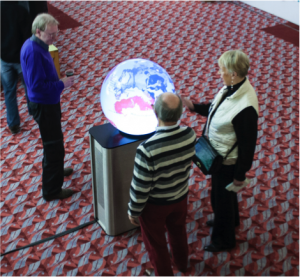 Grant Overview: Public interactive displays have the potential to significantly enhance the quality of life for people living in future city spaces. However, current public displays and interfaces go unnoticed or completely ignored by the majority of passers-by. This presents a serious problem for the impact and uptake of touch sensitive displays if only a small minority will approach these displays and discover their interactive qualities. Existing approaches to designing and evaluating public displays have not been successful at realising the substantial opportunities that public displays afford. This research addresses this problem by exploiting recent technological developments in curved displays to create socially acceptable and enticing interactions for public spaces. Curved displays offer exciting opportunities for public interaction that are not possible with flat displays. For example, a cylindrical display mimics the shape and form traditional kiosks for flyers and notices that can be seen in many cities. This kind of display can be placed in a walkway and be viewed from many perspectives. Other non-flat shapes, such as spherical displays, allow multiple users to interact while facing each other and viewing vertical content. Installations where users can see each other and observe others interacting are more encouraging and result in higher rates of interaction than displays where users are unable to observe each other. Another important aspect of a spherical display is that the entire display is never completely visible from one perspective. While areas on the top may be visible to both users vertical areas of the screen are only visible to some. These “private” areas of the display could be exploited to support sharing, ownership, and collaboration on a social display. Given the new opportunities afforded by curved displays, foundational research is needed to understand how this new technology should be designed for and used in public spaces. There is limited research on interaction for curved surfaces and even less on curved surfaces for public spaces. An important aspect of this research is to develop novel multitouch interaction techniques that exploit the form factor of a curved display for public interaction. This will involve perceptual studies to learn the physical constraints and ergonomics of multitouch gestures on curved surfaces. This research will also explore how novel gestures and physical metaphors can enhance interaction on curved surfaces. This will involve evaluating user perceptions of control and responsiveness on a spherical display, simulating different levels of friction and weight for interactive elements. Another important aspect of this research involves how curved displays work in real public spaces as compared to flat displays. Little is known about how different interaction styles encourage or discourage continued use of flat or curved public displays. In order to measure these metrics at scale for large numbers of passers-by, new evaluation techniques are needed. This project introduces a novel evaluation technique to capture and analyse pedestrian traffic around public installations. This approach can quantify different metrics of public display usage and enable the collection of large-scale data sets not feasible with traditional observation methods. Finally, this research also aims to dramatically change the approach to designing public displays by considering context and impact on local spaces. Previous work on public displays has primarily involved flat displays and focused on making displays as noticeable and enticing as possible. This presents the possibility of creating unnecessary or unpleasant distraction and actually making public spaces less enjoyable places to be. This research will not only measure how enticing our displays are but also critically analyse the impact of these displays on the places where they are deployed.